Q: How do you use the java simulation? A: First you need to know 7 parameters that describe your rocket. Each of these parameters is a result of design decisions you make. The first design decision is, "what pressure vessel will I use for my motor?" If you decide to use a 2-liter plastic bottle for your motor, then the Motor Diameter is 4.125 inches, Motor Length is 9 inches, and Nozzle Diameter is 0.84 inches. If you decide to use a different size bottle, then you will have to measure, calculate, or estimate the dimensions. Estimation is an important aspect of science. It's really a guess about a parameter of a physical system. "Aaahh..." (holding up your thumb here...) "...it's about 4 inches," is a good answer for the diameter of a plastic soda bottle. For physics, a +/- 20% result is high achievement! For irregularly shaped bottles use the largest diameter as the Motor Diameter, then calculate the equivalent length using the known volume of the bottle. This is complicated by the fact that the simulation wants inches for the dimensions. First, convert the volume of the bottle into cubic inches, then divide by the area of the largest diameter of the bottle to get equivalent length. The second design decision is, "what operating pressure will I use?" This depends on your choice of motor vessel, and the quality of your source of compressed gas. If you are using a 2-liter plastic soda bottle you may operate at a pressure up to 100 psi. Other smaller sizes of plastic bottles, in good condition, will also hold 100 psi. The limiting factor for Pressure will likely be your bicycle pump or compressor. Test your pump to see what pressure you can easily produce (up to 100 psi), and then use that pressure in the simulation. The third design decision is, "how much water will I put in the motor?" Load Fraction is the ratio of the water volume to the total volume of the motor. For example, if you put 0.8 liters of water in a 2-liter motor the load fraction is 0.4. The best Load Fraction for operating your rocket depends on many other parameters of the rocket. Finding the right Load Fraction is probably going to be the objective of your experiment with the simulation. Start with a value < 0.50 for load fraction, and explore how increasing or decreasing it effects the performance of your rocket. The fourth design decision is, "what shape of nose cone will I use?" Nose cone shape effects the Drag Coefficient of your rocket. If you use a parabolic or eliptical cone, and no fins, your drag coefficient is about 0.3. Adding typical water-rocket fins will push the Drag Coefficient up to 0.6. If you use a plastic bottle for the nose cone the Drag Coefficient will be closer to 1.6. Now that you have made design decisions you can test how well the rocket will fly! Enter the 7 rocket parameters into the entry fields on the simulator. Leave the other 5 simulation parameters set to their default values. You won't need to change these unless you are using extreme design values like high pressure or small diameter nozzles. Click the "Launch" button. In a few seconds you should see result that reflect how your rocket will perform. Left of the graph you will see 4 performance values to consider: Burnout Time, Total Impulse, Maximum Altitude, Total Flight Time. Burnout Time is the number of second from launch release to when the last water leaves the motor. Total Impulse is the integral of the thrust (lbs) force vs. time. This represent how much energy was delivered to the rocket during the rocket "burn." This value neglects the impulse due to air leaving the motor after the water is gone. Maximum Altitude is the predicted height (in feet) the rocket will reach. Total Flight Time is the time from release until the rocket lands. This assumes that you are not using a parchute, and that the rocket is aerodynamically stable. So, did you achieve your design goals? Did it fly high enough? Stay in the air long enough? Now comes the experimentation. Try changing your design to see if the performance improves. Decrease the Load Fraction and launch again... did it fly higher? 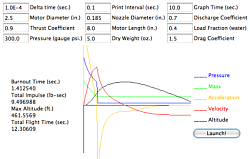 Change the Nozzle Diameter and launch again... did the performance improve? This is where rocket science meets engineering!